Abstract: Carbon-bearing rocks in subduction zones produce carbon-bearing aqueous fluids, silicate-rich supercritical fluids and carbon-bearing melts by metamorphic reactions during the subduction process. The formation of different fluid types relies on the compositions of rocks and the P-T conditions that the rocks suffered. The P-T conditions of carbonate devolatilization reactions depend on the initial compositions of fluids, and in the presence of H2O, the reactions occur at decreasing temperature conditions. At the high-pressure conditions, the dissolution of carbonate minerals in fluid is substantial mechanism for formation of carbon-bearing fluid, which parobably plays more important role than that of carbonate devolatilization reactions for carbon removal of rocks. In high-temperature circumstances such as hot subduction zones and in the case of diapirs of the rocks of subduction zones into mantle wedge, partial melting of carbon-bearing rocks can produce carbon-bearing melts that are responsible for carbon migration. 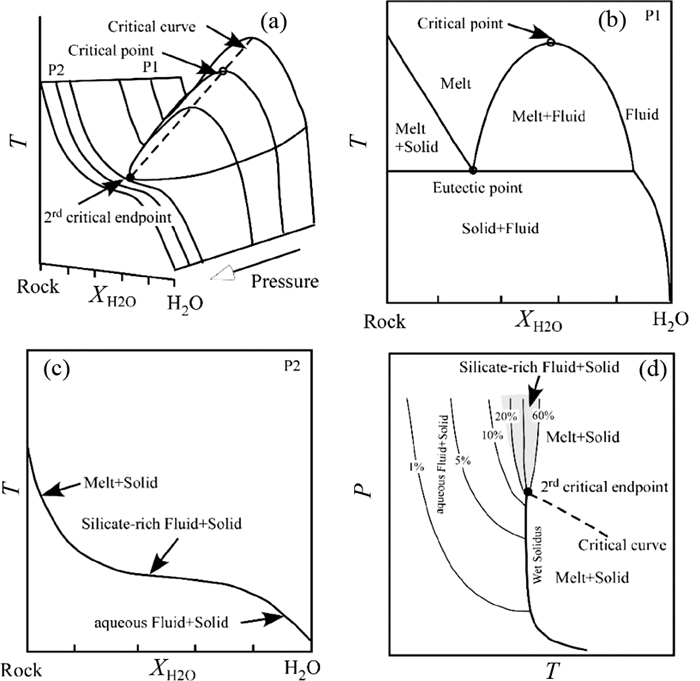 Silicate-rich supercritical fluids probably form above the second critical endpoint, and multiphase solid inclusions observed in some minerals of UHP rocks were considered to be crystallized from such fluids. However, there are many open questions, and more experiments need for such interpretation. Carbon-bearing rocks in subduction zones were brought into deep mantle by subduction, and produce different types of carbon-bearing fluids in terms of different geotherms of subduction zones. The migration of carbon-bearing fluids into mantle wedge results in formation of carbon-bearing arc magmas, and subducted carbon is finally released to the surface in the eruptive process of the magmas, which makes the cycle of carbon in subduction zone-island arc system. Bucher K and Grapes R. 2011. Petrogenesis of Metamorphic Rocks. 8th Edition. Heidelberg: Springer. Fu B, Touret JLR and Zheng YF. 2001. 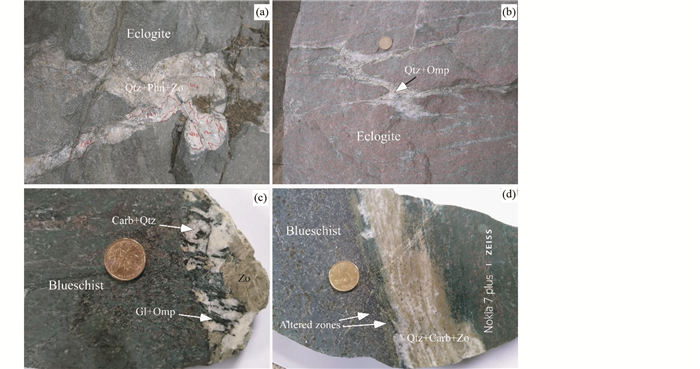 Remnants of pre-metamorphic fluid and oxygen-isotopic signatures in eclogites and garnet clinopyroxenite from the Dabie-Sulu terranes, eastern China. Journal of Metamorphic Geology, 21: 561-578. Kessel R, Ulmer P, Pettke T, Schmidt MW and Thompson AB. 2005a. The water-basalt system at 4 to 6GPa:Phase relations and second critical endpoint in a K-free eclogite at 700 to 1400℃. Earth and Planetary Science Letters, 273(3-4): 873-892. Spear FS. 1993. Metamorphic Phase Equilibria and Pressure-Temperature-Time Paths. Washington: Mineralogical Society of America. Thomsen TB and Schmidt MW. 2008. Melting of carbonated pelites at 2. 5~5.0GPa, silicate-carbonatite liquid immiscibility, and potassium-carbon metasomatism of the mantle.Earth and Planetary Science Letters, 267(1-2): 17-31. Tsuno K, Dasgupta R, Danielson L and Righter K. 2012. 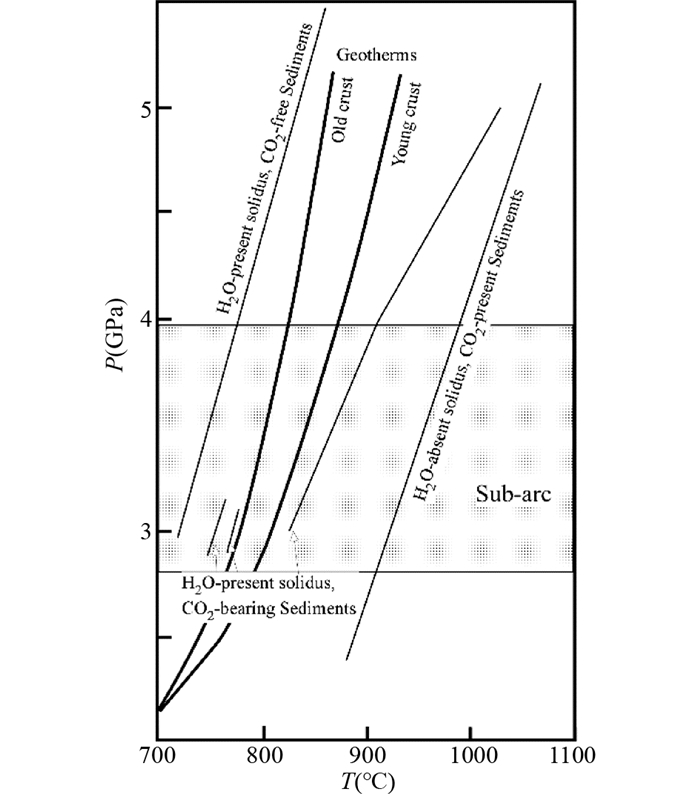 Flux of carbonate melt from deeply subducted pelitic sediments:Geophysical and geochemical implications for the source of Central American volcanic arc. Geophysical Research Letters, 39(16): L16307. Zeng LS, Liang FH, Asimow P, Chen FY and Chen J. 2009. Partial melting of deeply subducted continental crust and the formation of quartzofeldspathic polyphase inclusions in the Sulu UHP eclogites. Chinese Science Bulletin, 54(15): 2580-2594.